In the Japanese word “Sadou” the name of the Japanese tea ceremony, there is a Kanji (Chinese character) meaning “road”. This is the same as “Budou” the word for martial arts, and “Shodou” the word for Japanese calligraphy. The character of “the road” means to master one’s subject, and for “Sadou”, it is the road to master the world of tea. At first it seems that the world of “Sadou” is very hard and has a high threshold. However, The root “Sadou” is very close to our daily lives. Through “Sadou”, we learn many things. Beautiful and polite greetings makes a human relationship go smooth. By touching many tools, we learn the beauty and art of these tools and also learn the knowhow to treat them well with respect. We learn the turn of the seasons to achieve a new perspective in life and to lean back from our busy lives to reset our mind and heart. The world of “Sadou” involves many of the Japanese culture, making it a very deep world of history, culture, tradition, and also art. The room and space which the tea ceremony is done, the food and the tea cakes which is served together with the tea, the manners in which the ceremony is done, the tools, flower, clothing (kimono), the fragrance which matches the tea and also the season… all of these are involved deeply with the world of “Sadou”, and each subjects are an independent culture. To feel the seasons with all five senses, and to make a pleasant space for both the host and the guest. This is the aspect of “Ichiza Konryu”, which is the meaning for “a gathering to be pleasant and comfortable. The feeling one should behave toward others with sincerity.” This element is treasured in the culture of “Sadou”. In our daily lives, we enjoy the time of having tea at a café. 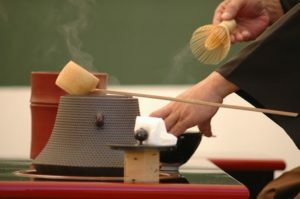 It is said that the culture of café came from China around year 800 A.D.
Around 12th century, a priest of Zen Buddhism learned the knowhow of drinking powdered tea, and brought back the tea and the tools to Japan, which afterwards spread throughout Japan, making tea known as a medicine for health and longevity. In 15th century, the culture technique of tea is widely spread. Many people starts to drink and compare the flavor of different teas, which start the culture of “Toucha”, a tea-tasting contest. Not only the flavor, but people starts to be particular towards the place to drink tea, and the tools to make a good tea. These people are known as “Chasuki”, which is the meaning for people who seeks spirituality in the world of tea. During this time the 3 elements of “Sadou”, which is “space”, “manners and technique”, “tools” are established, making the base of which is called “Sadou” nowadays. During the Muromachi era, the word “Sadou” does not exist, and two types of tea culture starts among people. One is called “Shoin Cha”, which people spend a great deal of money to buy the tools brought from China and other countries from the Silk road. People disposed their expensive tools to show their wealth. 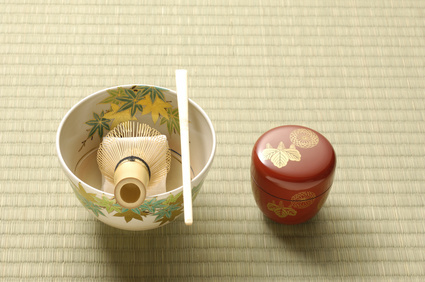 In contrast, another type “Wabi Cha” started among people who took in the spirit of Zen with the spirit of tea. This culture first started by Murata Shukou, a master of the tea ceremony. This was then passed on to Sen-no-Rikyu who completed the culture. 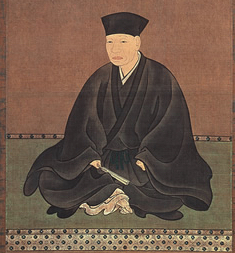 Rikyu served under famous leaders such as Oda Nobunaga, and Toyotomi Hideyoshi, which brought him many fame. Sen No Rikyu, the representative of “Wabi Cha” is known as the progenitor of all schools of “Sadou”. 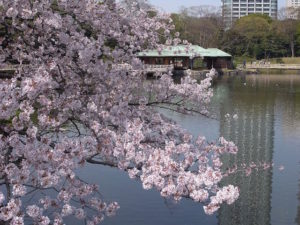 Soutan, the 4th generation of Rikyu’s school, and also Rikyu’s grandson started the “Three Sen-ke”, which is the generic name for “Omote Sen-ke”, “Ura Sen-ke”, and “Mushanokoji Sen-ke”, the three types of schools. These three schools still are famous even now. There are also other schools such as “Enshu-ryu”, “Ishisu-ryu” which is known as “Buke Chatou” which is another type of tea offering. At the present there are more than 500 types of schools, and each school has an original serving manners, tools and differs in the thoughts and spirit of tea. It is very interesting to attend many types of tea offering ceremonies and enjoy the variety of culture. Do you wish to know more about the world of tea and “Sadou”? But do you find it hard to take the first step? For those people, tea shops will offer you many different kinds of powdered tea. Also, there are tea ceremonies which take place at parks, which makes it easier for people to enjoy. To enjoy the ceremony, it is better to understand the basic manners beforehand. Next, I would like to introduce you the basic manners at the tea ceremony.